A CRM 2013 support case from one of our customers was raised and I investigated the error the customer was experiencing. 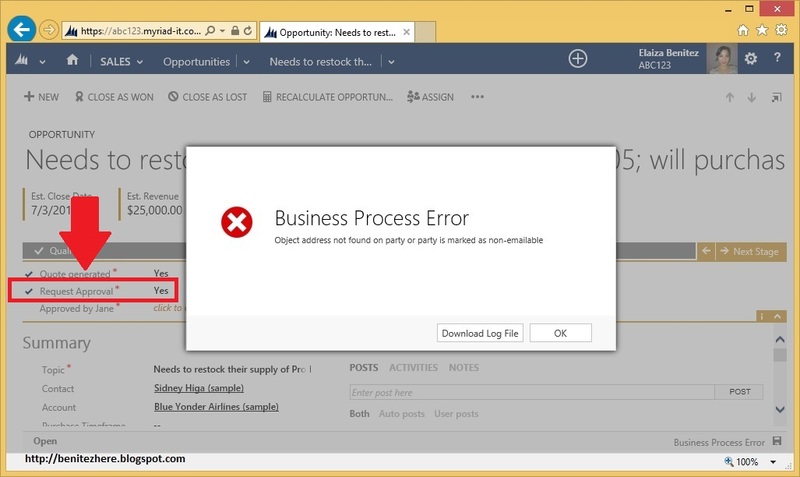 When navigating to the Marketing List entity in the Microsoft Dynamics CRM 2013 Outlook Client, an error was being displayed. Eeeek what do I do?! As mentioned in my previous post, remain calm and find inner peace. At first I thought maybe the error was being caused by one of our plugins so asked one of my ninja CRM developers to disable plugins one by one. No luck. 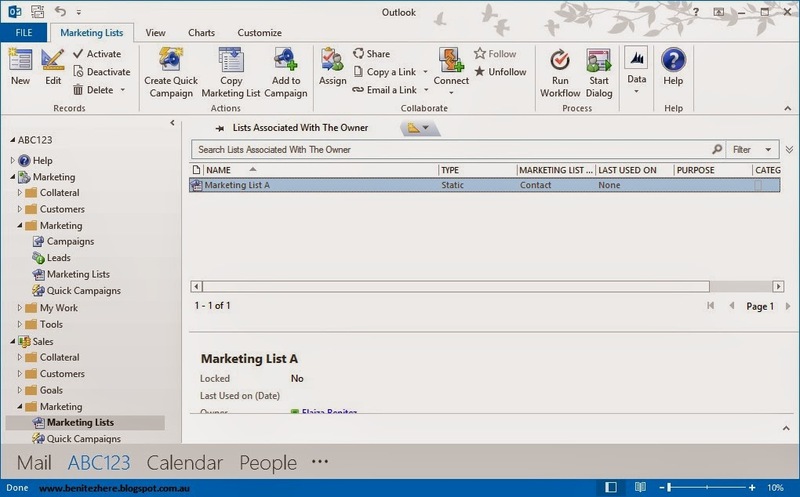 Then I thought OK, let's test with another CRM 2013 On-Premise environment by navigating to the Marketing List entity. No error occurred. Eventually I found the cause and I have reported this behaviour to Microsoft. 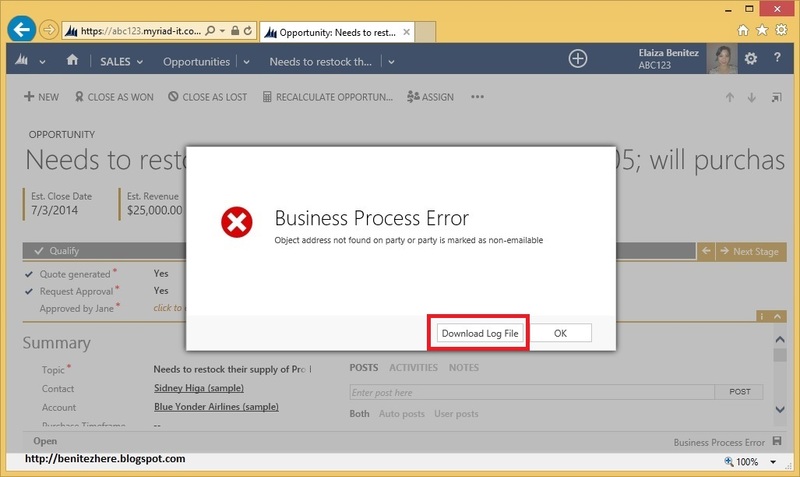 Hopefully it shall be resolved in the next CRM 2013 Update Rollup version. Other checks were then performed. This vlog outlines my investigation process of finding the cause and providing a workaround. 1. 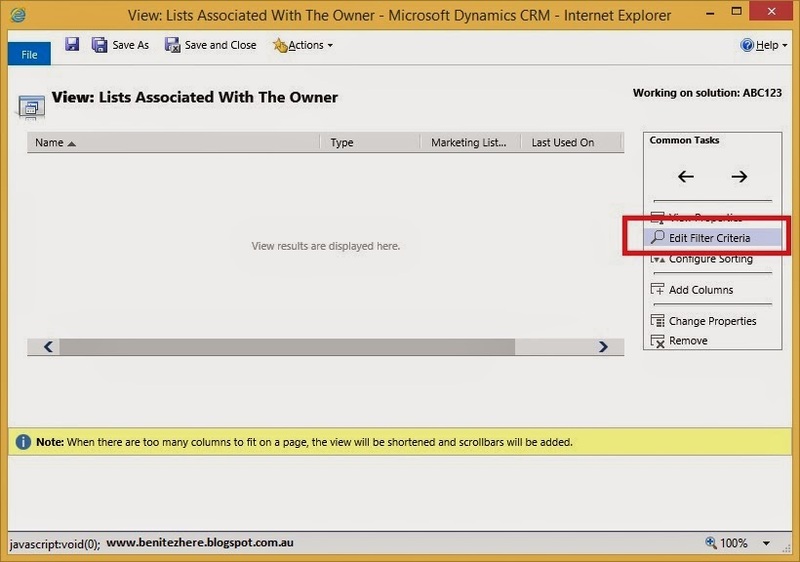 Navigate to the Marketing List View in the relevant CRM Solution and open the view. I assessed the current situation in CRM - the Marketing List View of "Lists Associated to Owner" was set as the Default Public View for the entity where the out-of-the-box default filter criteria was changed from Owner Equals Current User to Owner Equal Current User of User's Team.When I discovered this I decided to use the same criteria in another entity view to check whether the same error would occur in the CRM 2013 Outlook Client. The error was reproduced and I don't think there was anything incorrect that was applied as it works in the web client so reported it to Microsoft. Luckily, there is a workaround for this particular error that was experienced when navigating to an entity view int he CRM 2013 Outlook Client. This has been outlined earlier and in my vlog. If you're an existing end user of CRM and you have a CRM support agreement with your IT Partner (in other words your emergency CRM line), you can probably relate to this post. Sometimes we panic when trying to do a certain action in CRM as a result of an error message and we contact our IT Partner for help. The IT Partner will help but sometimes it can go around in circles (and some wolf howling involved) due to pieces of information missing in order for them to be able to troubleshoot the CRM problem raised. In this vlog I share with you some tips of how to work effectively with your IT Partner for CRM support cases. CRM support cases raised with your IT Partner usually comes with a cost. As soon as the support person starts interacting with you and investigating - that clock is ticking where his/her time is recorded against the case. If they need to engage with you frequently initially when the case is raised, that time will be logged against the case when it could have been eliminated if certain steps were undertaken. A lot of the time I recommend to my customers during the UAT and the go-live phase of a CRM project to try decipher the error message at first and review the data that is in the record where you attempted to do something. 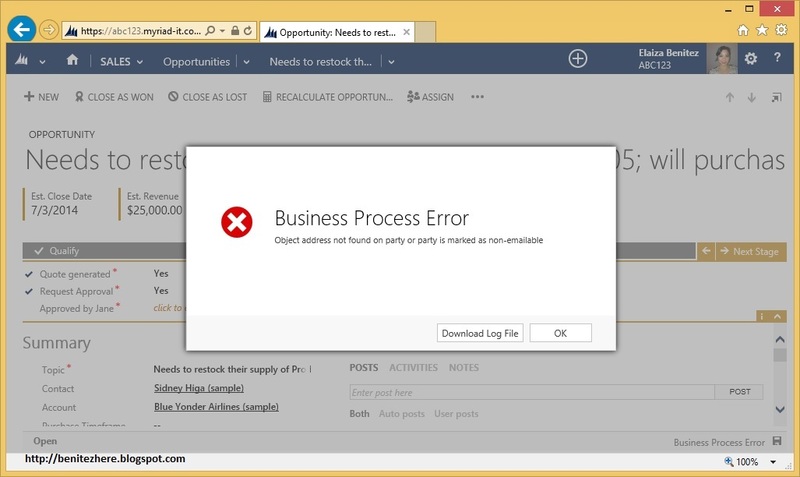 The error message 80% of the time will spit out something that is meaningful that can be resolved simply by assessing an item in CRM the error message has referenced. "OK, I don't know what this means?? Help!" The next thing to do is contact your in-house CRM super hero/power user/administrator and see whether they can help decipher the error message and resolve it themselves. If she/he can resolve it then hooray, no need to raise a support case. If he/she can't resolve it or you are that person people turn to and you do need further help, be cool and log a support case with your IT Partner. Sometimes frustration can get in the way temporarily - constantly repeating the steps you applied will not make the error go away, neither does slamming your keyboard in frustration. This is a good time to breath and recall your steps that lead to the error message. Inner peace, find inner peace.... OK, then start outlining these to your IT Partner in a Word document where you can attach it in the support web page of your IT Partner's helpdesk/support portal or email it through. There usually is a button called "upload file" or "attach file" where you can attach and submit your document that outlines the problem. management system the IT Partner uses where again, the content of the email is inserted in a field and the field will not be able to render the images. 1) The support person can see the images for each step without having to contact you for more information. 2) If you have a lot of screenshots saved as image files, you have to upload them individually. Using a Word document, you can insert all your screenshots in one file with your steps. OK, so how should I outline my details? 1) Outline the steps one by one in sentences in a Word document. 2) For each step, see if you can provide a screenshot. 3) As humans we can't read each others minds so sometimes even highlighting certain areas of the screenshot can help the support person focus in understanding the steps that lead to the problem. 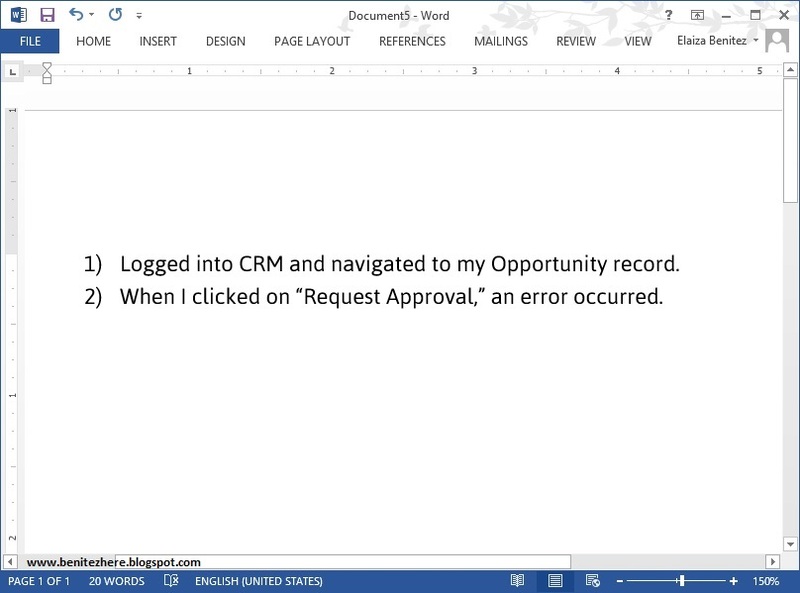 4) If the error is originating from steps you applied within a CRM record then provide the link of the CRM record. You can do this by clicking on the "..." command at the top of the record and select "Email link." This will then open your Outlook where a URL is provided. Copy and paste that record link. The support person will be able to click on this URL you have provided and access the record where the error occurred. 5) Provide a statement of what you were expecting as the output of your action. eg. the email that requests for approval should have been sent. 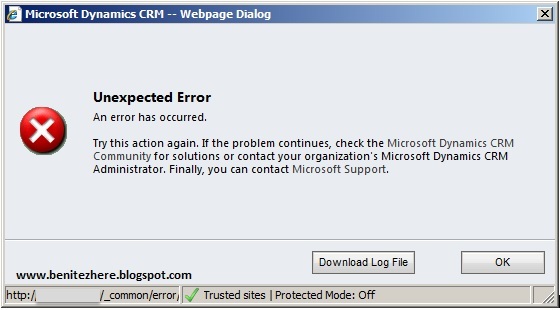 6) If there is a button in the error message window "Download Log File," click on this and save the file onto your PC. You can either attach this saved file on the support web page of your IT Partner's helpdesk/support portal. If you can't attach more than one file on the support web page, then copy and paste the content in your Word document which you can upload on the support web page. 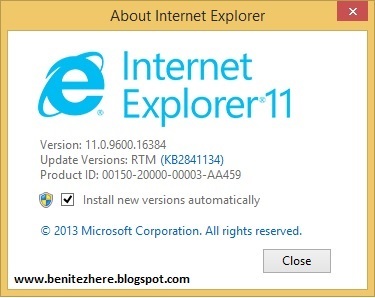 7) Provide the browser and version you were using. Microsoft Dynamics CRM is compatible with different browsers and sometimes it is useful for the support person to know in the rare scenario where errors will only occur in certain browsers. In summary, by following the steps above your IT Partner can start investigating immediately without having to ask you where in CRM did this error occur and what you were doing. You are effectively reducing the overhead cost of the support case by providing all the information upfront. Remember - that back and forth engagement the support person has to go through with you when minimal information of the problem is provided is factored into the time spent on the case. Reverse the roles for a moment - if you were helping someone with a problem they are facing within the software they use, can you help them without understanding how they came across the problem in the first place? You need to know what path the person went through before he/she was stopped by the error to understand and help out. Reality is that we don't live in the world of X-men where Professor X exists in support teams and can read your mind, and clearly see the steps you applied. Help your IT Partner by telling them the story so that they can help you in return. Awesome sauce! Now you know the recipe for logging CRM support cases with your IT Partner. PS: you can apply what you have learnt a few minutes ago in any support case that involves an application, it does not have to be CRM. At the beginning of this year I did some R&D where the challenge was to come up with a simple approval process using configuration, zero development. I used some of the new and cool features which you'll see in my vlog post. 2) Copied one of the out-of-the-box Business Process Flows and removed the Proposal Stage. Created a Quote stage where the steps used three of the custom fields. 3) Added Approved and Approved By fields to the Opportunity form in a new section called "Approvers Only." 5) Created two Field Security Profiles, one for the Approver of the Opportunity and the other for an everyday end user to allow/not allow update of the Approved field. 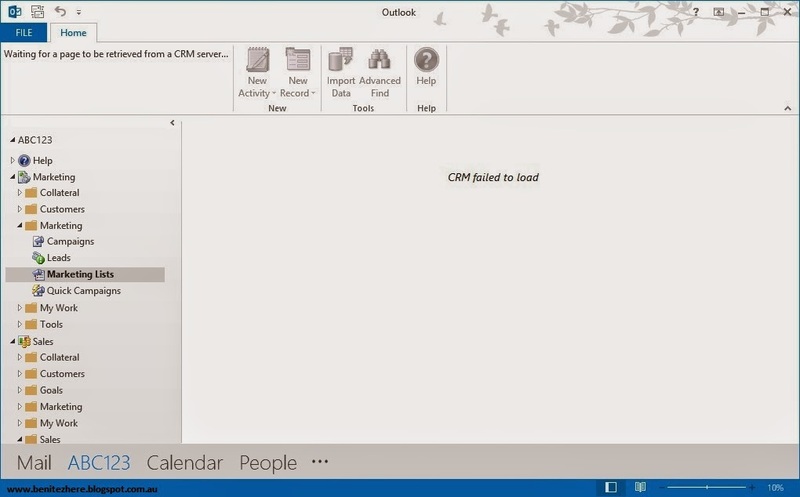 Pretty basic and utilized some of the new and cool CRM 2013 functionality. Please note that this is a simple approval process. In the scenario where there is multiple approvers required or different iterations of approval is required, consult with your IT partner as they will need to understand the process in order to come up with a more suitable solution. In the vlog I mentioned I'd provide a link to Gareth Tucker's blog that explains a bit about real time workflows, so here you go. 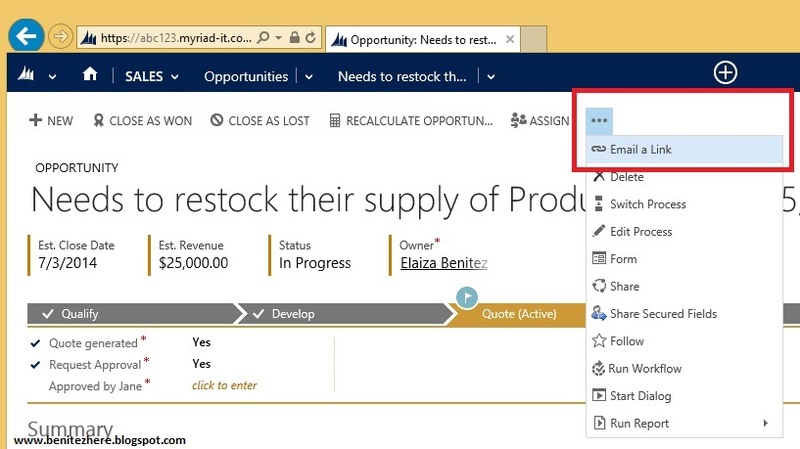 Another great piece that explains workflows in CRM 2013. I still don't know who the awesome author is of this blog but it's another good blog to check out.